Create positive affirmation such as “I feel vital and strong…so full of natural energy now that I’ve lost weight by paying attention to what I am eating and counting the calories I consume, eating smaller healthier portions and adhering to an exercise program. Measurable: Let’ make your affirmation even stronger by defining “having lost weight”…how much weight are you talking about? 5 pounds, 10 pounds, 20 pounds? Add that to your affirmation so it now reads ““I feel vital and strong…so full of natural energy now that I’ve lost 20 pounds by paying attention to what I am eating and counting the calories I consume, eating smaller healthier portions and adhering to an exercise program”. Attainable: Your goal must also be attainable otherwise you are trying to “fool” yourself and in the end experience defeat. Is your weight goal healthy for your size and frame? What type of genetics are playing into your picture? Don’t defeat yourself before you begin by trying to convince yourself that you can achieve something that you know in your heart is not possible. Making unrealistic proclamations like “I am going to exercise 7 days a week” is simply unrealistic and eventually lead to failure. Relevant: The next question you need ask is, is your goal relevant to your needs. If for example your affirmation includes some form of exercise define what kind of exercise you might choose and the key is to choose what you like to do. If you love to swim the work that exercise into your program and your chances of success are much greater than if you choose to “bicycle” if you have no passion for it. Time-bound: And, last but not least to this SMART puzzle is that it needs to be “time-bound” by setting an actual date. So, for example, your affirmation now reads: “On July 14, I feel strong and full of energy at 120 pounds by eating smaller healthier portions of food, being aware of how many calories I am consuming and swimming and walking for 30 minutes 4 times a week”. Now, that’s a SMART GOAL! 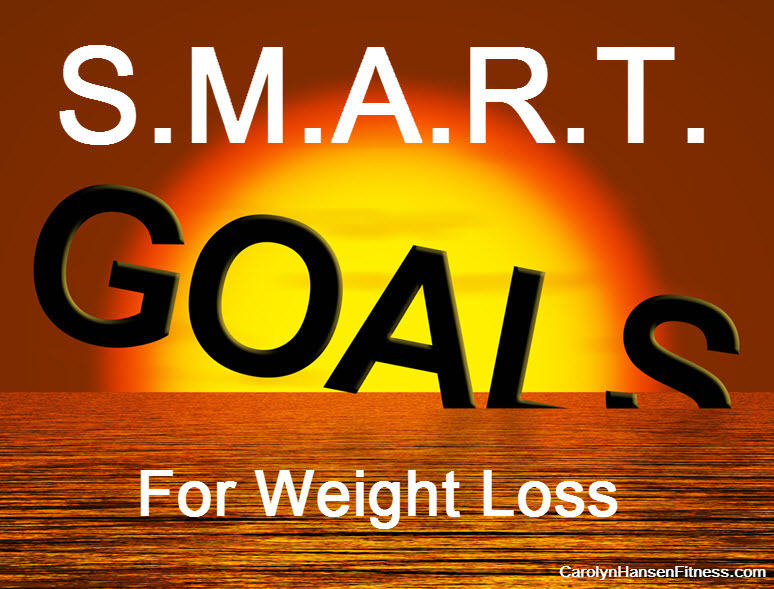 So, now it’s your turn…create your own SMART Goal and affirmation. Write it down so that your brain takes you seriously and pays attention and don’t shove it off in a corner somewhere. Put it on an index card and carry it with you…read it first thing in the morning and right before you go to sleep at night and well, whenever you are prompted to. Get your brain involved in the process…don’t try and “fool it” work with it and watch in amazement as your life and your weight shift. If taking weight off has been a struggle for you it most likely has nothing to do with anything you are doing, however in order to break this “hold” you are going to have to change things up and that’s where I come in. I created “Stop Weight Loss Resistance” for people just like you…those with heart but not the right direction. You can lose that “stubborn” weight…you just need the right information.